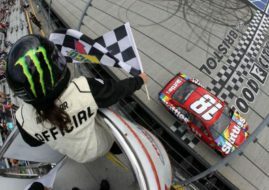 The #78 Furniture Row Racing Toyota of Martin Truex Jr was again a dominant car in the race, as many times before when he failed to win the race, but this time the 37-year-old driver finally converted two stage victories into an overall win. Truex Jr wins Quaker State 400 at Kentucky Speedway to score his third win of the season and tenth career win in the NASCAR Cup Series. With just one lap to go, Martin Truex Jr. had a lead of more than 15 seconds over second-place Kyle Larson, with only eight cars remaining on the lead lap. But, the caution interrupted a race for the eighth time. Truex stayed on old tires for the last restart with all other lead-lap cars coming to pit road for fresh tires under caution. Old tires weren’t a hendicap, as he surged past Kyle Busch through the first two corners and held the lead until a wreck behind him at the end of the first overtime lap caused the ninth caution of the night. Truex won the race, recording 152 leading laps (of 274). It’s his first ever win at Kentucky. Kyle Larson came home second, ahead of Chase Elliott and Denny Hamlin. The polesitter Kyle Busch finished in the fifth place. After eighteen races in the 2017 Monster Energy NASCAR Cup Series, Truex increased his series-leading playoff point total to 28, twelve more than that of second-place Jimmie Johnson. The next race on the Cup Series’ calendar is the Overton’s 301 at New Hampshire Motor Speedway.